This is important to realize, because it can be easy to reinforce bad behavior without even knowing that you're doing so! Take jumping, for instance. Your puppy gets excited and happy when you come home from work and jumps up on you to say hello. You think it's so cute, smile, and pet your pup while his paws are up on your legs. What you've just done is praise your impressionable puppy for jumping. So when he starts to jump on your visitors, kids, and everyone else, don't be surprised! You've taught him that this is good behavior! Dogs are always learning - there is no such thing as a "fully-trained dog". This is good news, as this means that you really can teach an old dog new tricks. No matter what age your dog is, no matter what breed, and no matter what mistakes you've made with your training in the past, your dog is always capable of learning something new. In dog obedience and training, voice commands as well as hand signals are used. Commands are best kept short and distinct sounding, so that your dog won't get confused as to what you're asking of them. The same goes for dog training hand signals. Make sure that each signal looks quite different from another, to avoid confusion. So What Exactly Is Obedience Training? Dog obedience and training consists of teaching a dog to reliably respond to different commands given by its handler. It can range from basic commands such as "sit", "stay", and "come", to high levels of competition in Obedience Trials through associations like the CKC (Canadian Kennel Club). Most people simply want their dog to be a well-behaved member of the family. Obedience training teaches your pooch how to listen to you, to be calm and relaxed. Of all the different dog training disciplines, obedience is my favorite because of how practical and useful it is for every day life! Obedience trialing takes hours of training and practice! Dogs are scored and judged for accuracy and performance. Simply being able to sit, down, and walk nicely on a leash are not enough to earn a title! Exercises need to be performed very cleanly and accurately. What does this mean? For example, many commands must be done off-leash. When doing a recall, your dog must come directly to you right away, without sniffing the ground or veering away, and sit straight in front of you (not at an angle or at your side). Competition obedience often includes retrieving, as well. This is done using obedience dumbbells, made of wood, plastic, or metal. Any breed of dog can do competitive obedience, but some breeds seem to really excel at it. 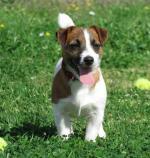 Working dog breeds in particular do very well in dog obedience and training. They thrive on the close relationship that is needed to such a great performance. These breeds were originally bred to work for and with humans, so that basic instinct is there. Depending on your dog's age and previous titles that have been won, you and your dog are placed into different classes to compete in. The CKC, or Canadian Kennel Club, has three main levels of testing: Companion Dog or Novice (CD), Companion Dog Excellent or Open (CDX), and Utility Dog or Utility (UD). While not necessary for anyone to achieve a title in dog obedience and training, it really is a good show of your dog's temperament. Why is this? Any dog who shows the mildest form of aggression is disqualified, whether it be towards people or other dogs. While purebred dogs and their owners have always been able to earn titles in competitive obedience, it's much harder for a mixed-breed dog to be even given this opportunity. CKC or AKC sanctioned events only allow registered purebreds to participate. In North America, there is a great organization that is dedicated to giving mixed-breed dogs and their owners the same opportunity to earn titles in obedience. The North American Mixed Breed Registry (NAMBR) offers Obedience Trials, Tracking Tests, and Earth Dog Tests. While mainly for the mixed-breed dog, both registered and non-registered purebreds are welcome, too. This is great news for those of you with a purebred dog that doesn't have papers! While competitive obedience is a lot of fun, it's not for everyone. Maybe you just want to have a well-behaved family dog, without the pressures of having to "perform" and win titles. I firmly believe that all dogs, regardless of breed or size, should be obedience trained at least in basic dog obedience training. Dog obedience and training is the foundation to having a balanced, happy dog. 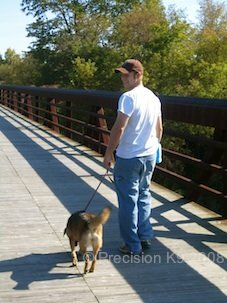 You can't even enjoy walking with your dog unless he has at least some training! And the best place to start with your puppy or new dog is with dog training classes. In the world of dog training, there are two main dog training methods. They are all-positive and balanced. Do some research, and decide which method you want to train your dog with. I personally use and recommend balanced training. I believe that you need both reward and correction for dog obedience and training, as well as most dog behavior modification. Balanced training uses positive and negative reinforcement, as well as positive punishment. Confused by these terms? Most people are! Positive reinforcement is adding something (like a treat or praise) to motivate your dog to repeat a certain behavior. Negative reinforcement is removing something that's unpleasant for the dog, in order to increase a behavior. For example, putting pressure on a dog's rump to get him to sit, and then taking that pressure away when he is in the sit position. Positive punishment is adding something that your dog doesn't like to get him to stop a certain behavior. For example, give a leash and collar correction when your dog jumps up on people. Every trainer you talk to will have different views on the best way to train. It really is up to you to take the time to find a trainer that you feel comfortable working with, and who's methods of training are humane and effective. It's a great idea to sit in a few classes if possible, to see what their training looks like in action. Each training school will have slightly different names for the levels, and some may have more levels than this. I recommend doing basic obedience training at the very least. This will give you control of your dog on leash for commands like heeling, sit, down, stay, and come. It's a good idea, though, to continue further training, so that you are able to control your dog off leash, too! Find out more about the different dog training collars that I recommend and don't recommend - there are great photos to show you what each collar looks like. When choosing a dog training class, make sure to ask what types of collar they allow or not. This is also a pretty good indication of whether you're talking to an all-positive trainer or a balanced trainer! The proper collar is essential to dog obedience and training, and a good trainer will be able to help you choose the most appropriate one for your dog. Dog obedience and training for a special needs dog is done a little differently. If your puppy or older dog is blind, for example, you'll need to use more hands-on training and verbal cues, while training a deaf dog consists of using hand signals or even a vibrating collar. Many owners who have a deaf dog use some American Sign Language (ASL) as cues for training purposes. Dogs are amazingly quick to pick up on body language... in fact, body language is in many ways more important to a dog than what you say to them! 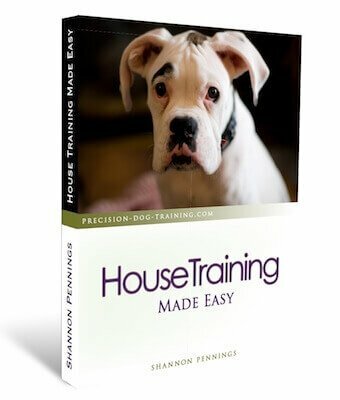 Aggressive dog training – No dog is un-trainable. Using humane methods, a dog that is prone to growling or biting at other dogs or people can still be obedience trained. Older dogs – Put that old wives' tale to bed. Believe me, a dog is never too old to learn new tricks! 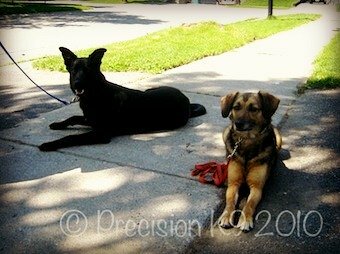 Rescue or adopted dogs – My dog, Justice, was a rescue pup, and she is doing wonderful in the Advanced Level!